Lord Dhanvantari is an incarnation of Lord Vishnu. 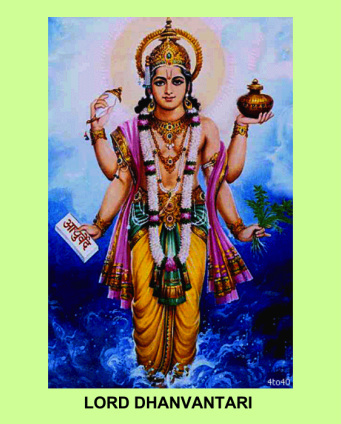 Lord Dhanvantari is regarded as the God of Ayurvedic medicine and is thereby the father of medical science. Ayurveda is an ancient science that derives from the Vedic philosophy. Ayurveda is the divine knowledge path for living a healthy & happy life. Ayurveda is the elixir of life and is derived from Lord Bramha, the creator of the universe. Previously, the acharyas (teachers) used to impart this ancient wisdom to their disciples verbally. Later on, Archarya Atreya and his disciples wrote down this science in the form of shlokas or sutras (verses) that formed the basis of Ayurvedic practice.